Family owned Renzo Company Inc. shows that it is possible to have a great product for people that is of high quality and still hang on to what is important. They have commited to creating eco-friendly toys that they stuff with love. The toys are hand knit and are very high quality gifts for the children in your life. Zubels has been in business for over 30 years and they offer traditional apparel that is to be cherished for years to come. They are 100% cotton and some are organic, the hats and sweaters are top of the line and so fashionable. 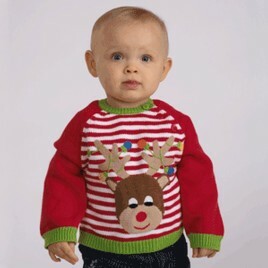 Look at this adorable set for the holiday season, these sweaters are just so nice you can easily layer them as they are not overly heavy and a t-shirt under and a jacket over will be comfortable for your children. 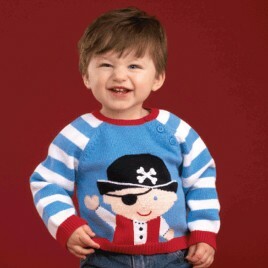 This Pirate sweater is one of my favorites, whimsical and cute, but still very masculine for the little boys in your life. I love the bright colors and clear striping on the sleeves, it really brings the whole sweater together. They sent this really cute sweater for David to wear this season and I just love it. Being in Southern California it is nice to have something that is made of cotton and is breathable. We do not get snow here and frankly we are having a cold Christmas if it is in the 50’s at night. We do want our kids to look like its winter and with the cotton sweaters from Zubels we have that ability now. This sweater is perfect to wear over a shirt and he is ready to go. You can see all of the really beautiful sweaters at Zubels website and many have hats that match as well. The little sets are just darling. Make sure you follow them on Pinterest, Instagram and Facebook so that you can keep up to date on their new styles! If you are looking for great gifts Zubels is the place to shop this holiday season! Previous post: Have You Heard of Pretty Peacock? These sweaters look so lovely. They look like they are high quality. This is the cutest brand, i could spend my entire paycheck in here. These are really nice. I might have to get something for my grand baby. Adorable, I love these!! These would make good baby shower gifts!! I would love to get the ballerina sweater for my granddaughter. These are too cute! And eco-friendly too. That’s a win win! Love Zubel! They have the best clothes. I love everything they stand for. My son would be cute as a button in that reindeer outfit. I am in love with Zubel’s – I have one rattle for them, and love to get many more! I didn’t even realize they had sweaters. They’re just so cute!! Aww, love the little pirate! Several babies have been born in the family in the last year or so & these would be great baby gifts!